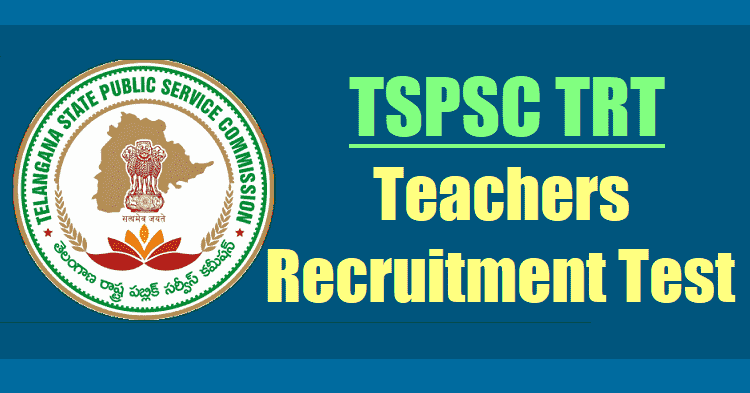 TSPSC Teachers Recruitment Test(TRT) 2018 Notification/TS DSC 2018: TSPSC TRT, Teachers Recruitment Test, TSTRT. After a long waiting we are noticing that the TSPSC Teachers Recruitment Test (TRT) 2017 Notification has been released. This is good news for unemployment youth/ youth, who are looking forward for teacher jobs. These teacher jobs were postponed from last one year. Finally Telangana State government takes decision in favor of unemployment youth. At last government has taken a decision to announce the TSPSC Teachers Recruitment Test (TRT) 2017 Notification on 21-10-2017. Finally Telangana govt has given green signal for to fill up teachers posts. As a result nearly 8792 teacher jobs going to fill up next year. After a bifurcation of AP first time released T government first DSC notification(TSPSC Teachers Recruitment Test(TRT) 2017 Notification). TSPSC TRT almost around 8792 posts going to fill up by TS Education department for that ordinance has been ready. The department has announced TSPSC Teachers Recruitment Test(TRT) 2017 Notification. Necessary action has been taken by DSE Telangana in order to release TSPSC Teachers Recruitment Test(TRT) 2017/TS DSC 2017 Notification. TS TET, TSPSC TRT should be held separately: The Telangana State government decided to conduct Teacher Eligibility Test (TET) and Teachers Recruitment Test /District Selection Committee (DSC) separately. The norms prepared by the National Council of Teacher Education (NCTE) would not allow to conduct a common examination for recruitment of teachers and conducting a common examination was against norms of NCTE and may lead to legal tangles hampering the recruitment process of the teachers. The TET was an eligibility criteria for Teachers Recruitment Test(TRT) 2017 and Teachers Recruitment Test(TRT) 2017 was a screening test for teacher recruitment. 20 per cent weightage would be given TET for calculating final score in the Teachers Recruitment Test(TRT) 2017 Examination. TS Teacher Recruitment Test(TRT) 2017(TS DSC) Notification has been issued by The TSPSC and TS TRT 2017 Exam would be conducted by the Telangana State Public Service Commission. TSPSC Teachers Recruitment Test(TRT) 2017 Notification/TS DSC 2017 for recruitment to the posts of School Assistants(S.A), Secondary Grade Teachers(S.G.T), Language Pandit Teachers (L.P.T), Physical Education Teachers (P.E.T) in Government, Zilla Parishad, Mandal Parishad Schools and Schools Under the control of the Tribal Welfare Department and Muncipalities in the Telangana State through the TSPSC TRT. The TSPSC will invite the online applications from the eligible candidates for recruitment teacher posts in various departments. As per the latest news Telangana TRT Notification for the year 2017 released by tspsc on behalf of Telangana DSE Board. TSPSC TRT Syllabus 2017 which has been prepared by NCERT and approved by DSE board on 20.10.2017. Based on this TSPSC has released TS TRT Notification. There is no much difference in the syllabus. Detailed TS TRT Syllabus 2017 is also released and for TS TRT Exam Pattern 2017 click on the below links are provided. TSPSC released the 5 TS TRT (Teachers Recruitment Test) notifications for 8792 vacancies. Teachers Recruitment Test was entrusted to TSPSC vide G.O.MS. No. 19 School Education (General) Department, Dt: 18/05/2016 and Finance Clearance was given vide G.O. Ms. No.129 Finance (HRM-11) Dept Dt.01/09/2017. TSPSC has prepared the notifications in accordance with the Teacher Recruitment Rules-2017 issued by the Government of Telangana vide GO Ms No.25, School Education (General) Department, Dt. 10.10.2017. For the first time TSPSC is conducting the Teachers Recruitment Test for 10 Districts. If a candidate is eligible for more than one notification, he should apply separately for each notification. The applications will be accepted from 30/10/2017 to 07/01/2018. The dates for exam will be in the 2nd week of February, 2018(TRT Exam Schedule: 24 to 28-02-2018). It should be noted by the candidates who apply for School Assistants, Language Pandits and Secondary Grade Teachers that 80% weightage will be given for written test and 20% weightage for Teachers Eligibility Test (TET). Further for the posts of PET and School Assistants (Physical Education), the selection will be based only on the merit in the written exam and no weightage will be given to the TET. The notifications are hosted on TSPSC website: www.tspsc.gov. in. So, Applications are invited Online from qualified candidates through the proforma Application to be made available on Commission’s WEBSITE (www.tspsc.gov.in) to the post of SGT, SA, LP, SA PEdn, PET in School Education Department. TSPSC TRT Revised notification Web note -Dt.12-12-2017 :: It is information of the Candidates/Aspirants who wish to apply for the posts of Teachers Recruitment Test (TRT) 2017 to the posts of SA/SGT/LP/PET vide Notification No's 52/2017 to 56/2017 to take note that in view of Hon'ble Highi Court Orders D.Ed.,(Specail Education)/ and B.Ed Special Education are allowed and Break up of vacancies as per 10 districts are notified on view of amendments ot G.O.Ms.No.25 SE(Genl) Dept., Dt:10-10-2017 by G.O.Ms.No.33 SE(Genl) Dept, Dt:11-11-2017. Educational Qualifications for TSPSC TRT 2017: Applicants must possess the qualifications from a recognized University/ Institution as detailed below or equivalent thereto, as specified in G.O.Ms.No.25 School Education (General) Dept., Dt.10/10/2017 as on the Date of Notification. AGE Limit for TSPSC TRT 2017: Minimum 18 years & Maximum 44* years. The age is reckoned as on 01/07/2017 (Rule- 12(1)(a)(v) of State and Subordinate Service Rules). FEE for TSPSC TRT 2017: (Remittance of Fee) Each applicant must pay Rs. 200/- (RUPEES TWO HUNDRED ONLY) towards Online Application Processing Fee, each subject applied for. This apart, the applicants have to pay RS. 80/- (RUPEES EIGHTY ONLY)towards Examination Fee. However, the following category of candidates are exempted from payment of Examination fee. READ | Know Your Previous TS TET /AP TET Hall Ticket Number/Results - How to Know? టీఆర్టీ పరీక్షలు షెడ్యూల్: ఫిబ్రవరి 24 నుంచి మార్చి 4 వరకు పరీక్షలు జరగనున్నాయి. టీఆర్టీ పరీక్షా కేంద్రాలు: రంగారెడ్డి, మెదక్, కరీంనగర్, వరంగల్, హైదరాబాద్, ఖమ్మం, నల్లగొండలలో పరీక్షా కేంద్రాలు ఏర్పాటు చేశారు. టీఆర్టీ పరీక్షలు: ఆన్‌లైన్, ఆఫ్‌లైన్‌లలో పరీక్షలు జరుగుతాయి. Web note: The candidates/Aspirants who wish to apply for the posts of Teachers Recruitment Test (TRT) - 2017 for the posts of School Assistant, School Assistant (Physical Education), Language Pandit, Physical Education Teacher, and Secondary Grade Teacher under the director of School Education Telangana State, Hyderabad notified vide notification no’s 52/2017,53/2017,54/2017,55/2017 and 56/2017 Dated 21/10/2017 that, the submission of online applications is further extended up to 7th January 2018.
may i know the exact age limit for telangana people (general catagory) ....? #TSPSCTRT -#TSTRT #TeachersRecruitmentTest: ఏళ్ల ఎదురుచూపుల కు తెరదించుతూ ఉపాధ్యాయుల నియా మకాల ప్రక టన వెలువడింది. ఏ జిల్లాలో ఎన్ని పోస్టులు న్నాయనే చర్చ సాగుతున్నది. ఈసారి టీచర్‌ రిక్రూట్‌మెంట్‌ టెస్ట్‌ (టీఆర్‌టీ) నిబంధనలు, స్థానికేతర అభ్యర్థు ల్లో సరికొత్త ఆశలు రేకెత్తిస్తున్నాయి. ఒక చోట దరఖాస్తు చేస్తే చాలు, అన్ని జిల్లా ల్లోనూ 20శాతానికి పోటీపడే అవకాశం ఉండడంపై హర్షాతిరేకాలు వ్యక్తమవుతున్నాయి. 1998 తర్వాత ఉమ్మడి ఆదిలాబాద్‌ జిల్లాను ఏజె న్సీ, మైదాన ప్రాంతాలుగా విడగొట్టి డీస్సీ నోటిఫికేషన్‌ వేయడంతో టీచర్‌ పోస్టుల సంఖ్య తగ్గిపోతూ వచ్చిం ది. దీంతో ఈ జిల్లా నుంచి నిరుద్యోగులు వేరే ప్రాంతా లకు వెళ్లి నాన్‌లోకల్‌గా పరీక్షలు రాసేవారు. పోస్టుల సంఖ్య ఎక్కువగా ఉన్నచోట దరఖాస్తుచేసుకొని పోటీ పడేవారు. అప్పుడు సొంత జిల్లాలో రాయలేకపోయే వారు. కొంత మందికి కొన్ని జిల్లాల్లో ఉద్యోగం వస్తే, వేరే జిల్లాల్లో రాసిన వారికి రాకపోతే నిరాశచెం దేవా రు. తమకంటే తక్కువ మార్కులు వచ్చినవారికీ ఉద్యో గాలు రావడాన్నిచూసి కలతచెందేవారు. కానీ ఇప్పుడు కొత్త నిబంధనలతో ప్రతిభ ఉంటే చాలు, రాష్ట్రంలో ఎక్కడైనా ఉద్యోగం వచ్చే అవకాశముంది. స్థానిక జిల్లాలో దరఖాస్తు చేసుకొని రాస్తే చాలు, ఆ జిల్లాతో పాటు మిగిలిన 30 జిల్లాల్లోని 20 శాతం పోస్టులకూ పోటీపడవచ్చు. ఇందులో భాగంగా అభ్యర్థులంతా తమ జిల్లాకు మొదటి ప్రాధాన్యం ఇచ్చి, మిగిలిన జిల్లాలను ఆప్షన్లుగా పెడితే సరిపోతుంది. అలా ఎక్కడైనా సరే ఉద్యోగం పొందే అవకాశం లభిస్తుంది. ఇంతకుముందు ఆయా జిల్లాల్లో 80శాతం పూర్తిగా స్థానికులకు కేటాయించగా, 20శాతం లోకల్‌తో పాటు నాన్‌లోకల్‌ అభ్యర్థులకు అవకాశం ఇచ్చేవారు. అయితే తమ జిల్లాలో తక్కువ పోస్టులున్న అభ్యర్థులు ఎక్కు వ పోస్టులున్న జిల్లాలో నాన్‌లోకల్‌ కింద పోటీపడే వారు. ఫలితంగా సొంత జిల్లాలో రాసే అవకాశాన్ని కోల్పోయారు. ప్రస్తుతం ఏ జిల్లాలోనైనా ప్రతిభ ఉన్న వారికి ఉద్యోగాలు వచ్చే అవకాశముంది. hi iam mahesh my original place is kurnool ,but my studies from 4th to inter in mahaboobnagar dist ,all study in telangana ,but my proof s adhar,and voter id, ration card etc are belongs to kurnool dist,AP ,so to write the DSC exam i want to change my adhar etc proofs,is nessecary please reply me, but study wise my local area belongs to telangana. NO NEED TO CHANGE.ALL THE BEST. So..meeru marks peragadam kosam malli raayochchu..
Vaddaunukunte Neruga TS DSC 2016 attempt cheyavachchu..
My wife is from Ananthapur. but she married me in the year 2010.is she is eligible to write dsc hear. She is non local....Non local category lo DSC attempt cheyochchu.. Her totall studies are in ap. "3rd Class to 10th Class" Studies lo Continuous gaa 4 years ekkada study chesthe meeru akkad local avuthaaru...Leda meeru chadivina class la lo ekkuva samvathsaraalu e jillalo chadivithe aa jilla meeku local avthundi..
Govt TS DSC raayalante thappkunda TET Eligibility undaali. and not CM also anounced the TET and DSC dates of 2016.
is there any one who can answer me ??? Recently LPCET Course Completed.....So, DSE Officials will release LPCET notification for 2016-2017..
my name mahesh. Iam parsuing d.ed 2nd year. Am i eligible dsc or not. Dsc 2016 ki. Present D.Ed 2nd Year Candidates are eligible to appear TS TET 2016 and also they are eligible to write TS DSC 2016..
D.Ed Candidates are only eligible to write SGT Exam..
sir dee cet web councelling ee year organization chestara ple . ap dsc sgt candidates are eligible to write ts dsc.....? Under Non Local qouta..You can write TS DSC 2016.. I qualified TET entrance 2014. Unfortunately, the hallticket was printed with my hustband name. After showing the enough documents, the staff allowed me to take the entrance test. After the exam, I wrote a letter explaining my issue to the concerned authorities (to ditrict collector) and I was informed that the results will be published by correcting my name. But this was also not happened. Please suggest how to take this forward and use my previous TET score to apply for DSC 2016. I qualified in TET 2014. Naa TET hall ticket lo na husband name print aindi. So anni documents proofs chupetaka, hall lo nannu exam rasenduku aloe chesaru and exam hall lo nunde nenu district collect ki na issue explain chestu letter rasanu. Hall lo unna staff and co-ordinator, naa results naa name meede vastai ani chepparu. But results kuda naa husband name meede vachai. Ee problem solve ayeduku evaaraina suggestion ivagalaru. Thanks in advance. Hai I Have Completed Bped But I didn’t Studied Intermediate Whether Am Elgible For DSC Or Not…..? Hello Sir!Does the DSC question paper will be in English??? ?Hope you will respond as soon as possible. Hello Sir !Does The DSC question paper will be in English this time TET paper,Because it is highly impossible to understand the question paper which is only in Telugu since being an English medium student. hai sir, iam from khammam district and studied upto 7th in same place.from 8th - 10th i happend to study in westgodhawary district and i completed my inter and D.Ed in warangal.at present iam doing my degree in hyderabad.so now which district comes as my local ? as i am planning to write tsdsc 2016. plz....reply me as early as possible. hai sir, i have posted a comment since long back nd no response. plz... give the reply as early as possible. Hi Sir, I am sravan. From vizianagaram.non local quota lo chances antha. Tet akkada exam centre pedithe aa district loney dsc rayala.plz clarify my doubts sir. Telangana DSC announce this month? Last years previous question papers.